Space shuttle Discovery lands at Kennedy Space Center in Florida, completing the STS-131 mission to the International Space Station on April 20, 2010. NASA's plan to move the space shuttle Discovery out of itshangar in preparation for its final voyage has been delayed at least a daybecause of a water main break at the Kennedy Space Center in Florida. Discoverywas slated to move from its maintenance hangar to the cavernous VehicleAssembly Building at the spaceport early Wednesday so engineers could attach theshuttle to its external tank and twin solid rocket boosters. But a 24-inch(61-cm) water pipe broke near the 52-story assembly building, cutting off thewater supply to the shuttle launch facility in Cape Canaveral, Fla. The shuttle transfer was postponed to Thursday, to begin noearlier than 6:30 a.m. EDT (1030 GMT). "The center is closed down ? only open to essentialpersonnel," Kennedy Space Center spokesman Allard Beutel told SPACE.com. Discovery is being moved from the hangar, called the OrbiterProcessing Facility, in preparation for NASA's STS-133 shuttle flight to the InternationalSpace Station in November. The shuttle is slated to launch on its final missionNov. 1.This delay should not change Discovery's launch date, Beutel said. "We have enough cushion right now so it won't affectthe target date, at least right now," he said. Meanwhile, preparations for the mission are continuing atNASA's Johnson Space Center in Houston, where the six STS-133astronauts are rehearsing for their flight. The mission to the InternationalSpace Station will deliver spare parts and external experiment platforms, aswell as a closet-like storage room and a humanoid robot assistant, named Robonaut2, for astronauts. Discovery's final mission, the 133rd shuttle mission sincethe fleet began launching into space in 1981, will also be the 35th mission tothe space station. NASA plans to fly only two more shuttle missions before the spaceshuttle fleet is retired in 2011 to make way for future missions to visitan asteroid by 2025. 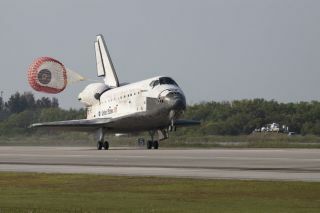 The possibility of a third shuttle flight, which would flyin summer of 2011, is being discussed in Congress.